The maraschino cherry is one of the most popular cocktail garnishes, but are those bright red fruits the best for your drinks? The truth is that many of today's store-bought maraschinos are injected with artificial ingredients and dyes, and they are not very good to eat. It may look like a cherry, but it certainly doesn't taste like the real thing. There is hope for the cherry lover, though. Whether you’re dressing up your drinks or topping an ice cream sundae, it's very easy to make your own maraschinos from fresh cherries. The maraschino cherries we know and use today are not a variety of cherry. Instead, the name comes from the manufacturing process used to preserve them. Originally, maraschino cherries were marasca cherries (originated in Croatia) preserved in Italy's maraschino liqueur, which is distilled from the same cherry. Over the years, the cherries caught the attention of mostly aristocratic Europeans as a tasty little treat. The cherries made their way to America and around Prohibition, a controversy arose; with the ban of alcohol, so went the liquor-soaked cherries. The liqueur is pronounced using the Italian mare-uh-SKEE-no. The cherries are typically pronounced mare-uh-SHEE-no. The modern maraschino cherry was a product of that era. It is the creation of Oregon State University Professor Ernest H. Wiegand. He spent six years in the 1920s and 30's developing the brilliant red fruit. The goal was to help cherry farmers preserve their Royal (or Queen Anne) cherries in an alcohol-free way that could compete in the growing maraschino market. Wiegand devised a process of soaking the fruit in a brine with calcium salts. This groundbreaking technique led to the methods used today. It also gave Oregon the notoriety as a leader in advances of the "cherry," including the rainbow of maraschinos available today. 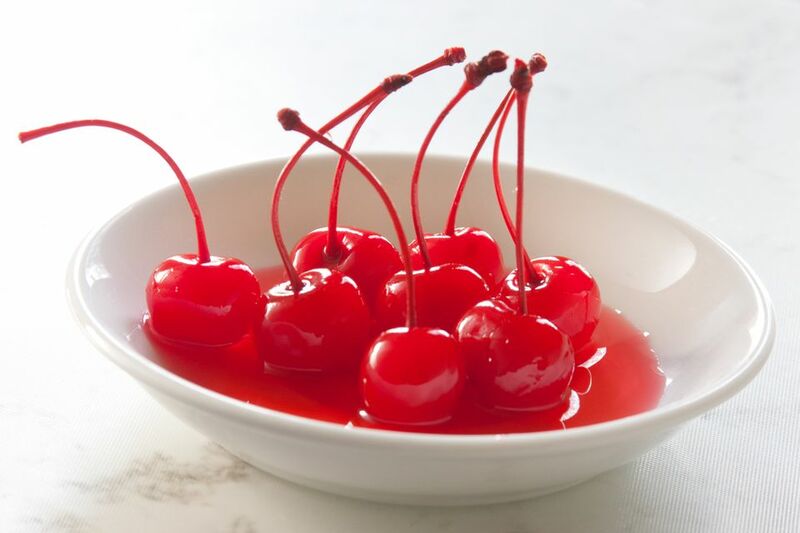 The modern maraschino cherry is soaked in a salt brine or—even worse—a solution of calcium chloride and sulfur dioxide. This bleaches the cherries, removing their natural color and flavoring. They are then pitted and soaked in a sweetener (typically high fructose corn syrup or HFCS) for about a month. The final step of dipping the fruits in artificial coloring (that lovely Red #4) gives the modern maraschino its overly brilliant red color (or any other color desired). "The term 'Maraschino Cherries' is regarded as the common or usual name of an article consisting of cherries which have been dyed red, impregnated with sugar and packed in a sugar syrup flavored with oil of bitter almonds or a similar flavor." That is actually a rather broad definition. If you’ve browsed the canned cherry options at the store, you know that the “similar flavor” can have nothing to do with a real cherry. It’s not difficult to find cherries flavored with everything from lemon and lime to passion fruit and blueberries. It’s a rainbow of imitation cherries that merely resembles the real deal because the stems are (sometimes) intact. The syrup these cherries are packed in only adds to their demise. It is disturbingly sweet and inundates the mutilated cherries even more as they stew inside the jar for months on end. The syrup also creates a sticky mess. The resulting cherries are too sweet, even for ice cream sundaes and flirty martinis, and they’ll only infuse those treats with their less than desirable qualities. If you take great care with every other ingredient, it is only right that you step up the quality of the garnish, but what can you do? Many consumers are beginning to realize that their jar of maraschino cherries is put through a process that leaves them about as far from natural as possible. This has led to an interest in "real" maraschino cherries. The organic and natural foods market has fueled the trend and you can find "natural maraschino cherries" in more and more locations. The labels will clearly state that they have "no artificial coloring," "no preservatives," or "no red dye." Maraschino liqueur-preserved maraschino cherries are still commercially available. They are limited in availability and often have a price that matches. This prevents many bars from using them, which is why you’ll still see many serving those cheaper maraschinos. If you spot the fakes at your favorite hot spot, it’s perfectly fine to politely ask them to hold the cherry. In the U.S., the cherry season lasts from spring through much of the summer. This is your opportunity to make the best cherry garnishes of the year. From Manhattans to piña coladas, maraschino cherries adorn many of our favorite cocktails. That little red ball adds a finishing touch with just a splash of class that can dress up almost any drink, no matter the flavor. If you are looking for a garnish with a true cherry flavor, standard maraschinos are not the way to go. Instead, use a fresh cherry or go with one of the naturally-made maraschinos. Flags: Made with an orange, pineapple, or a similar slice of fruit, the cherries are pinned to the fruit with a cocktail skewer. It's often seen on tropical cocktails like a piña colada. Boats: Cut a whole slice of a large orange and wrap it around itself to make a funnel shape. Pin it in place with a skewer, then place a cherry in the center. It's a great garnish to float on top of juicy highball drinks like the tequila sunrise. Also, the different colored maraschino cherries (e.g., blue and green) are fun, though the flavor can be a little off from what you may expect. This is especially apparent with green maraschinos, which can be minty at times. These can throw off the flavor of a drink, so be careful where you use them. Unless the cocktail calls for it specifically, always serve a cherry with the stem intact so the drinker can easily pop it in their mouth if they choose. The modern maraschino is more candy than cherry and while it does not add much flavor to a drink, drinkers often enjoy the sweet treat at the end of their cocktail.